Those seem to be two of our favorite words around here. Michael and I often talk about that first year together: the many nights we walked hand in hand feeling the chemistry growing between us, and the days we spent sharing our hopes and dreams for the future. I remember sitting down at the kitchen table one afternoon, with a ruler and pencil in hand. We were busy designing the a-frame home we hoped to build for ourselves. The upstairs had a loft bedroom, and downstairs, running alongside the hallway, we sketched out a sun room. Whether we could ever afford it or not wasn’t the question. This was our dream home–something we hoped would be in our future; something we planned to work alongside for. And it wasn’t. But a couple can dream can’t they? Some of the best conversations we had were spent dreaming. I wanted to know everything about this man including his hopes and dreams for the future. I can tell you right now–if he would have told me that he wanted to go to the moon, I would have been cheering him on every step of the way. I was his biggest cheerleader, and he, mine. It didn’t matter how big his dream was, I believed that he could achieve it and my greatest hope was that I’d be there beside him when he did. But here’s the thing… “And the Lord God said, It is not good that the man should be alone; I will make him an help meet for him.” – Genesis 2:18. Living together is more than living under the same roof, it’s about living a unified life. The one flesh concept is the same idea as two plant stems that are grafted together. We open ourselves up (cleave) to envelope the other. Two become one. And so it’s important that we keep dreaming together. Because we’re in this together for life. Negativity lurks in every corner. We don’t need more of that when we open our heart to another. What we need is love and encouragement. I know that Michael is talented, he’s smart and he’s a great leader, but does he know that? I wonder how many times a day that voice inside him tells him that he can’t, he won’t, and he never will. I can’t tell you the many times I’ve told myself I can’t write. I had always wanted to be a writer, but I didn’t think it was possible until one person told me I could. It goes to show that the power of encouragement goes a long way. A greater power yet is the power of God. It’s an honor to encourage my husband and to be there to remind him that when God brings you to it, He will bring you through it. That doesn’t mean that everyone who wants to go to the moon will surely land on the moon. But it does mean that when you put your trust in God He’ll lead you to greater paths than you could imagine. He’ll birth a great desire within you and equip you for the journey ahead. Let God plant those desires in your heart. Let Him take the lead. And trust Him to equip you. His dreams may be the same as yours, but sometimes they may differ. And if they are different? Handle his heart with great care. Communicate your concern with loving kindness, and bring your concerns to God asking that His will be done. 1. Start with contentment. Don’t use dreaming as an excuse to lust after the world. If we aren’t thankful with what we have today, we won’t be content tomorrow. Achieving our goals is fulfilling–it’s fun–but nothing on this earth will satisfy us the way that Jesus Christ can. 2. Listen. People express their dreams all the time. Once you’re aware of that, you’ll start to notice. 3. Be courageous. Don’t be afraid to dream big. Sarah laughed when the angel told her that she would bear a child. She was well past the age of child bearing. But God promised Abraham that he would become a great and mighty nation, and all the nations of the earth would be blessed in him. It took a leap of faith for them to accept this. Joseph was betrothed to marry a virgin when an angel spoke to him in a dream telling him that she was to bear a child that was conceived by the Holy Spirit. It took courage on his part to stand beside her and walk in obedience to God. I can’t even imagine the emotional turmoil they went through during this time. This was at a time when women were stoned for such things. But they trusted God with their future. 4. Be an encouragement to each other. Remember that the power of encouragement goes a long way, and our words reinforce that. 5. Spend time doing nothing. Slow down your life long enough to have heart-to-heart conversations. 6. Share your heart with him. Start talking about the future. Is there a class you hope to take? A ministry God is calling you to? Do you want a larger family? Keep the lines of communication open. Discuss your dreams and your concerns. 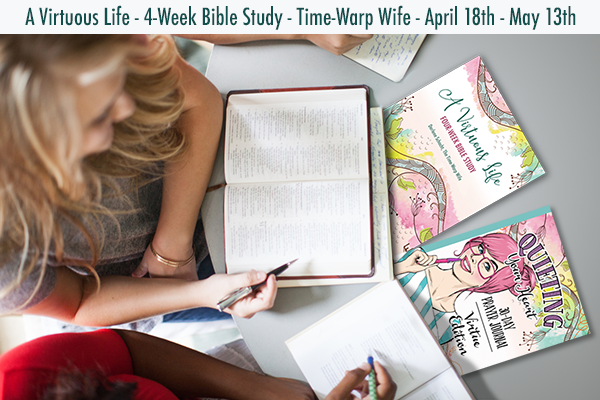 “A Virtuous Life” is a 4-week study that leads us through the Bible in search of virtue. What is virtue? Why is it important? And what does the Bible have to say about it? These are just a few of the questions we’ll study as we make our way through the four weeks. I so look forward to and enjoy your blog each day. i want to share with you how my husband has dreamed pretty big and is reaping the benefits of it. He has always been a history lover. Many many years ago, we began doing historical re-enacting, dressing up in 1812 time period clothing and going to different forts and historical sites and participating in programs they have. This has taken us to many many cities and towns in Canada (where we live), and also in the U. S. As you can well imagine, the clothing for this is not readily accessible, so my husband taught himself how to make the clothing, then figured out how to also make the leather cross-belts and cartridge boxes. His dream was always to have a mobile military museum that he could take out to forts and schools and historical sites to help educate the public about our military history. One day we were in an antique store, and he bought a cap badge. I asked him what it was and what it was for, and he informed me that it was worn on the men’s cap to identify which unit they belonged to, and how he was going to have mobile military museum one day. I said to him, “Sure you are”!! He brought it home, wrapped it in a Kleenex tissue, and put it into his dresser drawer. Then he bought another one, and another one, and after about 6 of them, he bought a small plastic container and kept them under our bed. (The money he made from sewing uniforms and things paid for these items, and still does. He makes about $2 an hour doing this, but he wanted the hobby to feed the hobby). Fast forward about 27 years, and he now has over 2,000 artifacts, encompassing from The Boer War to Korea, all wars Canadians fought in. He has recently retired and is looking to develop an educational program where he can go into the schools and do a “living history” demonstration and help to educate our children. I am so impressed by his tenacity and dedication to doing this. He has taught me that no dream is ever too big, too small, but, most importantly, too difficult to do if you want it badly enough. Thanks for listening. Wow. That’s a fascinating story! Love it! Thank you for sharing this with us. May God bless you and keep you as we go through this journey together. I am so thrilled to have found you and your blog/bible studies. Thank you for the free printables- I love art and coloring and studying Gods word at the same time is the icing on the cake!! This is lovely! Thank you for your encouragement — I so appreciate it! 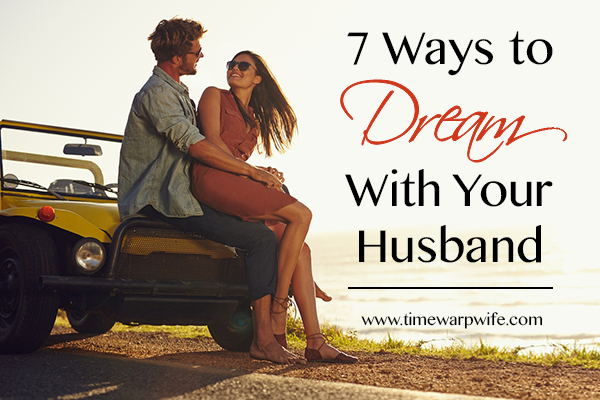 We’ve just passed the two year mark in our marriage but I’ve found it is so easy to forget to dream with my beloved or accidently be a discouragement to him. Your words were a timely message to my heart. Thank you!